What is a great review? You’ve just gotten engaged. Your to do items include finding an enormous amount of specialists to all help your wedding day dreams come to fruition. Sometimes making these choices to find businesses isn’t as easy as other things. You can use people that did your friends/family’s past wedding but for a lot of us it’s a journey into a large world of options and choices. You may have had great experiences at different Sioux Falls weddings you may have seen or heard of wedding nightmares. Ultimately it all comes down to who you feel is going to make you feel the most comfortable. We were extremely pleased with working with Complete Weddings. Emily did a great job with getting all the pictures we requested and more. Just looking at the sneak peaks I know they will all be beautiful. Griffin was so professional and listened to details of the kind of music we wanted to hear. The guests complimented us on what a great dj he was. Couldn’t have asked for anything more. When it comes down to customer service at COMPLETE we believe the proof is the pudding, or in this case the review. Don’t settle for a great music selection or someone who took good photos. Find the company that did the unexpected or something extraordinary and truly made the brides day. For any of you that are reading this used us for your wedding let us know how you truly felt with our service, we set the bar high for a reason. 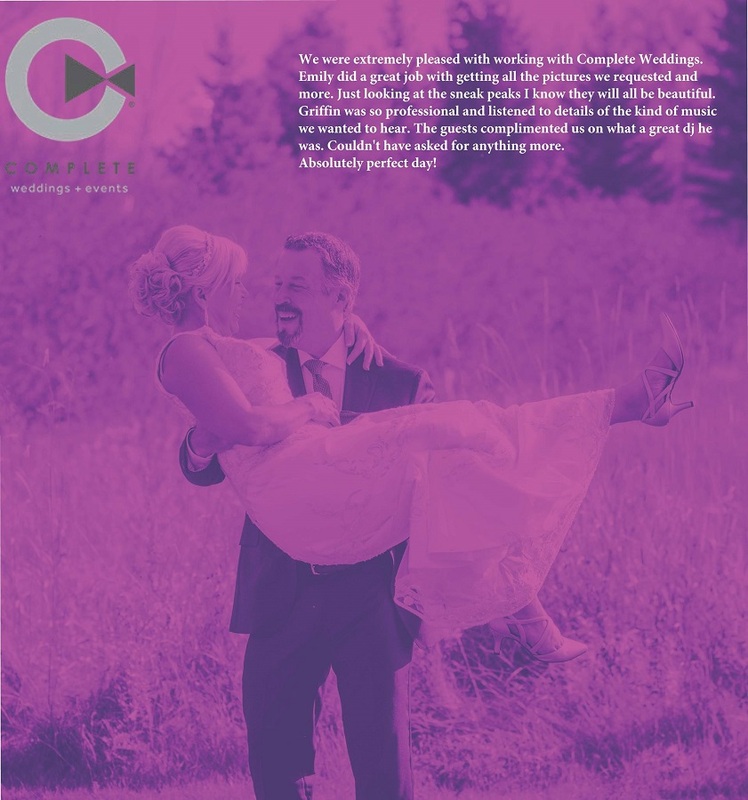 Complete Weddings + Events, Fargo’s leading provider of event and wedding photography, videography, lighting, DJ services & photo booth rental.